Try listening to my writing piece in podcast format below! I’ve debated over writing this piece for over a week now. When I first drew the art for it, it seemed a little powerful. Then I realized what I had to write to go with it. It’s scary, but I know it’s time to share my thoughts. God told me so, and here we go…. Like Dr. Martin Luther King Jr., I have a dream too. I know humans are starting to lean in to what I envision for the world a little bit at a time, and that makes my heart happy. While this is great to see, I know my dream will not be fully achieved during my lifetime, and I have to be fine with that. My heart tells me though, that my ideas, among many others, will one day become reality. I have a dream that the human race will stop using color language. Every time I hear someone say “black girls”, “black men” or “white girls”, “white men”, it hurts my heart. One day there will be no color attached to our descriptive language of each other. Once we stop using color to describe each other, a beautiful thing will happen. We will all become HUMAN, because it is what we all are. Yes, we all may have different beliefs, cultural backgrounds, and speak different languages, but we are all humans. Sometimes I ask myself “Why did God create races in the first place?”. After contemplating, meditating, and praying on this for a while (and studying science), I truly believe the color of skin is simply linked to helping humans adjust to their native environments. Look at how people from very warm regions of the world have darker skin. Their darker skin helps protect them from harsh sunlight. God didn’t make us a variety of colors so we could hate on each other for looking different. He (oh, by the way, my God is a He. Yours may be a She or an It, and God says that is totally cool) also didn’t intend for us to segregate ourselves due to the color of our skin. He knows we will eventually get that and start coming together to celebrate our differences, despite what we look like. I also believe he intended us to become one race at some point. I love seeing the blur of race starting to happen. When I see someone that is clearly not 100% one race, I get happy. 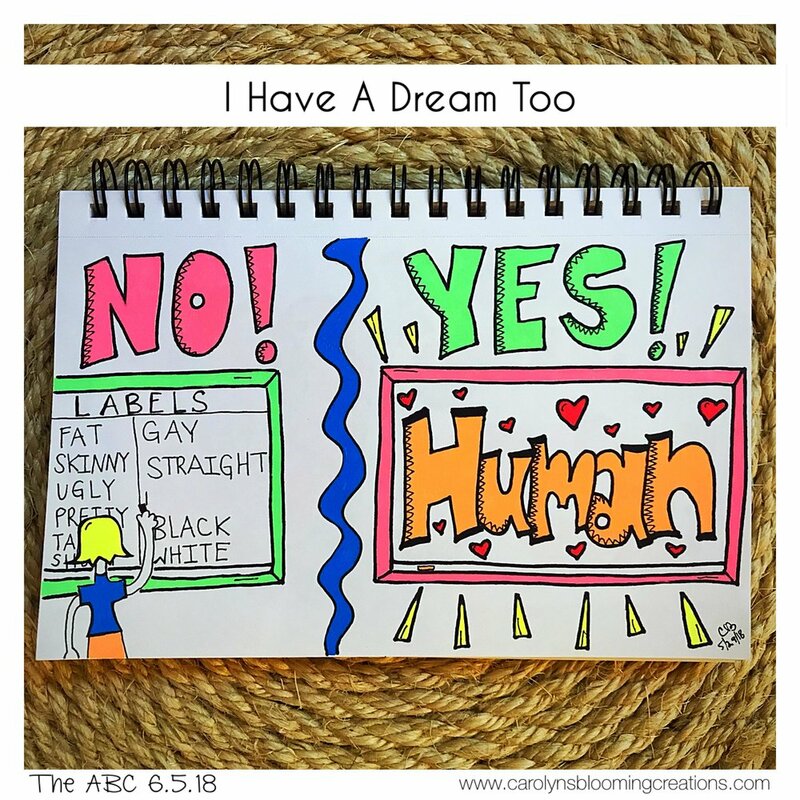 I have a dream that the human race will stop using labels when it comes to sexual preference. Saying someone is gay or straight is a label in my mind. Being such a young world, we use these labels to define ourselves, but will eventually understand it is not necessary. Just as we will eventually stop calling each other “black” or “white” (or whatever other color words we use to describe ourselves), we will also stop defining ourselves as LGBTQ. Once again, we are HUMAN. When we define ourselves with a sexual preference label, I feel we are, in a way, trying to say we are different, when in fact, we are not. One day we will simply say “I AM HUMAN.” We must all understand there truly is no difference between us. There is nothing wrong with who you prefer to be with in a relationship. If you love each other, that’s all that matters. I have a dream that humans will stop belittling each other for the way they look. Humans still haven’t gotten the memo that not all skeletal makeups have the same size bones. Some humans are meant to be larger and some are meant to be smaller. Some are meant to have wider noses and some are meant to have smaller ones. Once again, I’ve asked God why He made us this way. The only answer I received for this was simply “If everyone looked the same, it’d be a really boring world.” You could apply this answer also to why we are so colorful. I have a dream that all humans will understand God doesn’t make mistakes. What about those humans that feel they are in the wrong body and then have an operation to change their sexual organs? I have to add my thoughts in on that one, and you may not agree with me, but that is okay. I believe we are all spiritual beings that come to be human when we choose to do so. If you find yourself feeling you are in the wrong human body and need to alter it, do so. Just know, it wasn’t God’s doing. You chose the body (we all have “free will”) when in spirit and if you feel you need to change, by all means, go for it. God doesn’t think poorly of you because he knows you chose it. If you do so, use your experience to educate others so they can understand that there is nothing wrong with you. I have a dream that all humans will embrace each other with love. Some may think I have “hippy-dippy” ways in thinking that everyone will one day hug and kiss each other non-stop, will never speak a word to harm another human’s heart, will never physically harm another human, and will live in blissful, loving glory. That’s fine, as everyone is entitled to their opinion. I just know this one thing: LOVE rules all. One day humans will put only LOVE on a pedestal, and that is that. I have many other dreams, but this concludes my thoughts for today. I hope and pray my words find the people they need to find and help pave the way for someone to start to think in a new way. I hope you have dreams for a better world too and can summon up the strength to put your message out in the world too, however you wish. Always remember this: peaceful words reach listening ears in a beautifully effective way. Sending light and love to all who need it!